Ready to work for yourself and test out a new profitable business idea? Home-based businesses are extremely common these days and the way to go if you want to enjoy a flexible schedule working from home and have fewer start-up costs. Brick and mortar businesses can cost a ton of money to get up and running which can lead you to take out a business loan. With a home-based business, your less likely to take out a loan because usually, all you need is a computer, internet connection, a few office materials, and a solid business plan to get you started. Then, you can start making money quickly. 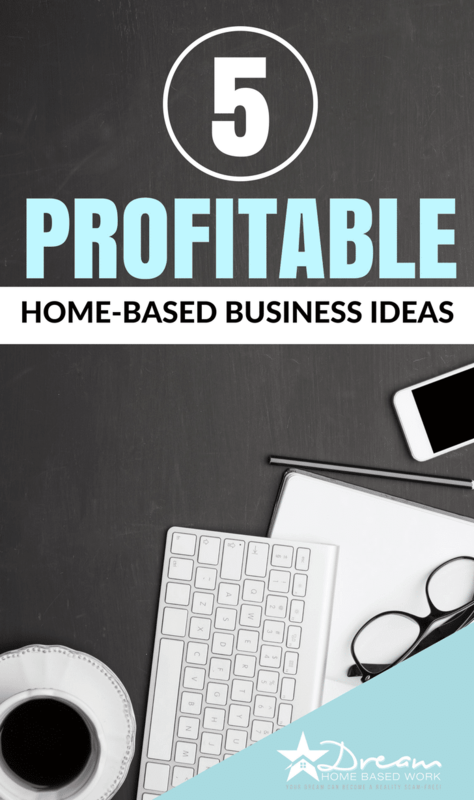 This is the first installment in a new Home-Based Business Series on Dream Home Based Work where we'll discuss lucrative home-based business ideas along with how to get your business idea off the ground so you can start bringing in profit. 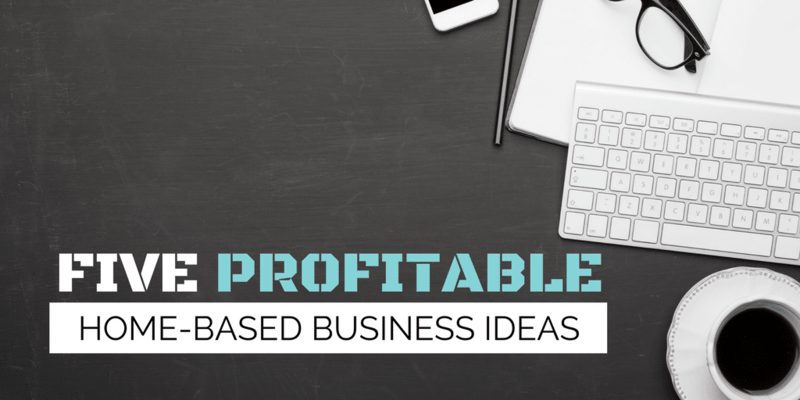 Here are 5 of the most profitable home-based business ideas of 2017. Reliable virtual assistants are a growing need for busy online entrepreneurs. Bloggers and business owners need help with secretarial tasks to keep their operations running smoothly, and that's where your business can come in handy. First, you need to determine your skills and what type of services you can offer. Generally, you'll need a computer and internet connection to get started. You'll also need a planner or spreadsheet to help you stay organized and office equipment like having a printer or copier will help too. That's about it. If you like to write, starting a freelance writing business requires hardly any start-up costs and can allow you to start earning money fast. You need just about the same equipment as you would with a VA business, but you get started with even less. Personally, when I started my freelance writing side business, all I had was a Microsoft tablet. I used my husband's laptop to write articles and went to the library to print and scan contracts out for new clients until I could afford to invest more into my business. It's best to choose a specific niche to specialize in along with whether you want to create articles and blog posts, how-to guides, or technical content. That way, you'll know which clients you need to pitch. Childcare businesses are a popular way to work from home doing something you love while providing quality care for children in your community. If you have space in your home and like kids, you just need to obtain the proper certifications to turn your home into a daycare. You can set your own hours and rates that will appeal to parents and even partner up with someone else who can work with you so you can watch more kids. You can also offer additional services to increase your profit like before and after school care and pick up and drop up to and from a local school. Fast typers will love this business idea. A transcriptionist basically takes audio and video content and turns it into text. Sometimes this involves typing things out work-for-word, or summarizing it. There are many legitimate companies that will hire transcriptionists to work from home, but you can always branch off and start your own business so you can set your own hours and have more control of what you earn and who your clients are. You may want to start getting work from an online company in order to build your experience. Generally, you'll need a computer and high-speed internet connection along with some good quality headphones and a foot pedal from Amazon so you can pause and rewind the audio when you need to. Reselling is when you buy something at a discount (new or used) and sell it for a profit. Many thrifters are resellers and some even do it full time. You can sell your items online on websites like Amazon and eBay and even use a service called Fulfillment by Amazon to professionally package and ship your items for you when they sell. Have you ever thought of starting a home-based business? Which one of these ideas would you be most likely to try? What questions do you have about started a home-based business? Hi Chonce, as I can find here, you have provided the most in demand work at home career opportunities. Apart from starting a work at home job, giving your work at home career a kick start with some home based business is really a great idea. Thanks for sharing it with us.